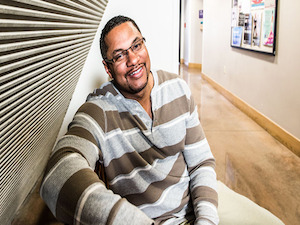 As recently as 18 months ago, Jason Bell had no choice but to tell parolees in many California cities outside San Francisco that they couldn’t access a 50-year-old university program serving formerly incarcerated people aspiring to college degrees. However, that has changed. San Francisco State University (SFSU) is now replicating Project Rebound — believed to be one of very few formal initiatives of its kind in this country —which has helped hundreds of formerly incarcerated individuals enroll in college and supported them until graduation. This semester, 117 Rebound students attend SFSU. Jason Bell is regional director of Project Rebound. Furthermore, at least five Rebound students now attend each of seven other California State University institutions: Sacramento State, Fresno State, Cal State Fullerton, Cal State Bakersfield, San Diego State, Cal State San Bernardino, and Cal Poly Pomona. All but Fresno State and Sacramento State are in Southern California, where Bell says nothing comparable to Rebound existed previously. The late Dr. John Irwin, who earlier in life had served time for a robbery, established the original Rebound initiative at SFSU in 1967. As a parolee, Irwin finished college and became a longtime SFSU sociology professor and nationally known advocate for prison reform. Rebound has helped facilitate special admissions to SFSU to men and women who are no longer in prison or jail and who hold at least a high school diploma or GED. Rebound has provided participants vouchers for meals and public transit along with a textbooks stipend. Rebound’s full-time staff has generally consisted of alumni of the program and SFSU who have had firsthand experience in facing the challenges and anxieties of returning to brick-and-mortar classrooms, sometimes after an absence of many years. They have mentored participants, helped them adjust to college life and paired them with student interns for additional support. Sometimes the assistance is explaining the functions of different university offices. At other times, it’s showing participants how to submit term papers and class assignments by using email, a tool that’s usually inaccessible in prison. “There’s a lot of handholding of students, especially with new students,” says Bell, who spent about a decade as director of SFSU’s Project Rebound before the replication effort got underway and had served nine and a half years for attempted murder. The assistance and support for Rebound students have fueled success. Since 2005, for instance, 140 Rebound participants have earned bachelor’s degrees from SFSU for a graduation rate of 90-plus percent. Among all SFSU undergraduates, only about half complete degrees within six years. Perhaps even more importantly, recidivism is so low among Rebound participants that the number of people who become repeat offenders or commit parole violations can be counted on one hand from one year to the next. California has one of the highest recidivism rates in the nation — about 61 percent within three years of prison release, according to a 2014 state Department of Corrections and Rehabilitation report. However, inmates throughout the country who participated in education programs offered through the prison system had 43 percent lower odds of recidivism than those who did not, according to a 2013 RAND study. So, it’s no surprise that post-incarceration college studies can result in similar, positive outcomes. Unfortunately, the number of applicants to SFSU’s Rebound in recent years was sometimes twice that of those accepted into the program because of limited resources, Bell says. In addition, some parolees cannot attend SFSU in the first place if one of the conditions of their release calls for not traveling beyond a specified distance or area. So it was quite common before this academic year that Bell and others had to turn away academically qualified people who were paroled to Southern California, for example. The current replication of SFSU’s Project Rebound to other Cal State institutions is being financed through a $500,000 grant from the nonprofit Opportunity Institute, which promotes social mobility and equity through education and related policies. “By transforming these Californians into college students and graduates, this will improve public health and safety, build economic mobility and make communities safer,” said Rebecca Silbert, senior vice president of opportunity and justice at the Opportunity Institute, in awarding the grant last year. Bell’s priorities this school year have been to establish program leaders at each campus along with building networks in key departments such as financial aid and bursar. At SFSU, other staff are continuing the long-running work of Rebound, which also includes legal help if a student has problems with parole or securing a professional license in fields such as nursing or counseling. Higher education officials throughout the country have contacted Bell and his colleagues about launching programs targeting formerly incarcerated people. But Rutgers University’s Mountainview Communities is the only one he is aware of, aside from Rebound. As a Rebound participant, Bell earned a bachelor’s in sociology and a master’s in counseling from SFSU. He is excited by the fact that replicating Rebound at other Cal State campuses already has resulted in men and women taking the same steps he did after leaving prison. “We are living examples of successful re-entry,” Bell says.